Numerous shiny, outstanding colors to style your board from the -friendly prized- new brand Encore. We took two twin tips of them out for a test, both of them containing a carbon spine with a very specific, interesting shape. Carbon isn’t an automatic choice as we learned from Alvaro Onieva and Saul Customs which makes us very curious how the Encore Inferno and Paradise perform on the water. To get the specific shape of the carbon, Encore uses an unique process by cutting it with a laser. That is the only way to created it like Encore does. The outline of the carbon looks almost art and could well be the result of scientific research to fit the perfect behaviour of a twin tip. Encore describes it as being inspired by the kinetic behaviour of Plants and Insects exoskeleton. The core of the twin tips is, similar to a lot of other twin tips, from Paulownian wood. All Encore boards (officially an UK brand) are custom made by hand in Poland (Europe) by and ready within three weeks. Sold directly to the customer. What exactly the definition is of made by hand, is hard to tell. We know a lot of automated machines are used in both regular produced boards as with custom made boards. Encore ensures us that no automated machines are involved (see also the reaction of Encore below the review). But at least the amount of colors and figures on the Encore are more or less numerous (over 100 options). The boards always come with a specific shiny, or High Gloss Encore look. Both tested twin tips have a single concave and medium rocker outlines. Each one has 4 sizes to choose from. 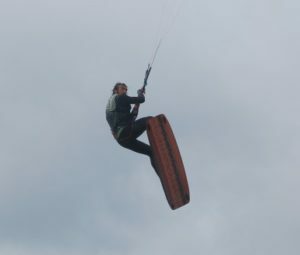 We were happy to see it is possible to choose from 3 different types of pads&straps (comfort, comfort small and performance) and 2 types of fins (carved and speed). There are no wake style fins available by Encore though. 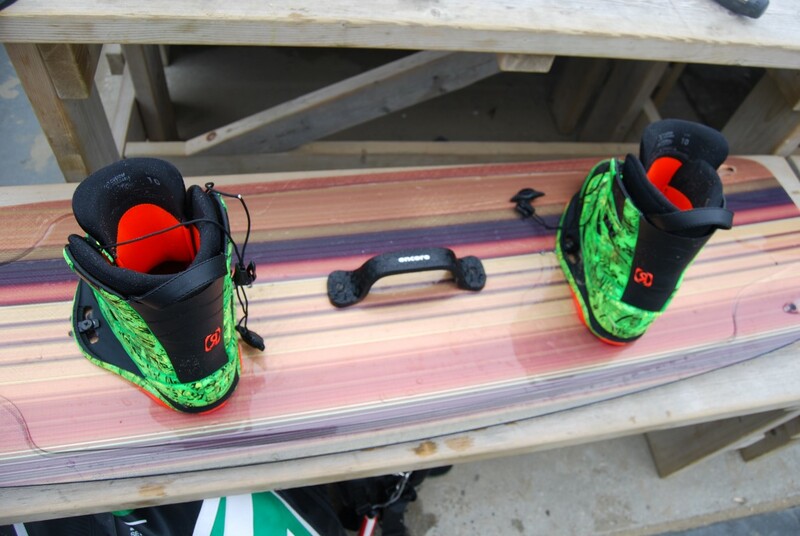 We used on both boards the carve fins and the performance pads&straps. The pads and straps have 3 stance options for the distance to the rail and 4 (Paradise) up to 6 positions (Inferno) to fit any pad or boot. Too bad there is no option to buy the twin tips without pads&straps. The fixed price for a complete board is 660,- Euro, which nowadays is to be considered quite modest. The straps are pretty okay. They are comfortable and have no hard edges and doesn’t give way in a hard landing (unlike the F-one straps for example). For smaller feet (roughly under EU Size 40) like most other brands the straps and pads tend to be a bit too big. Encore also offers a small size foot strap (Another option is to go for the Naish Apex in that case). Not everybody liked the typical, shiny Encore looks. Funny detail is that the designers of Encore don’t want to spoil the looks of the board so dramatically, that they don’t even put the sizes on the board(!). The freestyle/new school aimed Inferno is quick and easy to get going. The benefit of the carbon spine becomes at its clearest mostly in lighter conditions. The board is ridden more than averagely on the fins instead on the rail. This creates and more upright stands on the board which is a kind of an relaxed feeling. In other words it is not sharp cutting extreme freestyle machine. 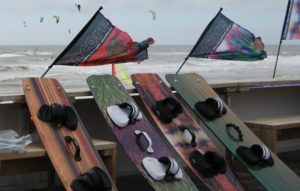 It wins in going upwind from most other boards we know. This lighter feeling reminded us of the North Select twin tip. Which is quite a compliment for the Encore Inferno, as it is about half of the price of the North Select! 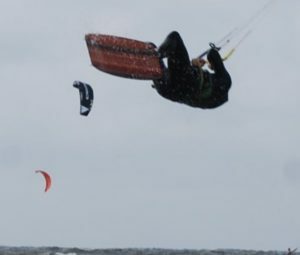 But there are also side effects which is less appealing to more full power (C-kite) oriented riders. When the Inferno is being pushed to its limits, in overpowered conditions for example, the board tends to get a bit nervous and doesn’t reach the end speed from the Clash boards or a F-one Trax. Jumping is easy, mainly again due to the direct responding feeling. Probably the -positive- effect again of the carbon, while the pop doesn’t feel particularly extreme. The fact it jumps so easily without the need of extreme powered input from the rider may be the Inferno most interesting aspect. Winning a daily Woo jumping height competition with the Inferno in moderate winds is not unthinkable. Landings with the medium flex and rocker are not as soft and comfortable as a F-one Acid, but softer than that of the North Jaime. In general the Inferno is very well suited for the intermediate rider. For more extreme wake- or freestyle moves Encore offers the twin tip Nirvana. We didn’t test the Nirvana (yet). The Inferno can also be ridden with boots. So mething interesting, since carbon and boots is a rare combination these days. From the amount of broken F-one Acid with carbon in combination with boots we know it is not always without risk. How the Inferno deals with the (extra) stress from the boots on the long(er) run is hard to tell. 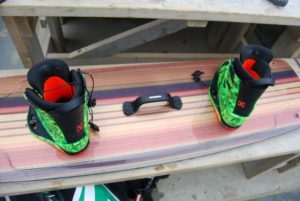 We had a couple of sessions with boots, and the Inferno becomes a bit more aggressive compared to riding with straps, but it doesn’t turn in to a pure freestyle board. The rail of the Inferno seems to be to missing some sharpness for that and it needs to be fitted with wake style fins to make it closer to the perfect freestyle feel. In general the on-the-fin-riding feel is even more pronounced on the Paradise than the Inferno. This means it does gets going even faster and upwind than the Inferno. The Paradise is stiffer, less aggressive and has less of a play fullness feel as the Inferno. Going from the Inferno to the Paradise felt as a step back, especially for the more experienced kiters. The Paradise has less rocker compared to the Inferno, a bit too less to our taste. On flat water cruising upwind in light to medium winds the Paradise feels at it’s best. But for a more wider usage the Inferno clearly is more suited. It doesn’t need much explanation we all preferred the Inferno more than the Paradise. Thanks a lot for creating the review for encore. Overall it is very clear that this is an independent and neutral assessment of our boards. Our boards are made by hand = Craftsman with over 20 Years of experience. Great attention to detail and precise craftsmanship during each step of the production process. We believe that every detail is important. No Automated machines are used. 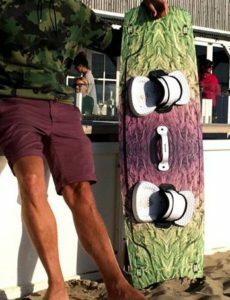 We don’t offer a board only on the website, we think thats overall a very good deal for a high quality board including all the accessories.